It is that time of year, when the weather is getting nice, the sun is out more, and the temperature is reasonable enough to be outside more. It is also the time for an increase of youth sporting activities. Increased sports activities also, increases the chances of sports injuries. In the United States more than 2.6 million children ages 0 to 19 years old each year, are treated in emergency departments for sports related injuries (CDC, 2017). Some of these children have life threatening injuries that affect them the rest of the lives. Get a pre-participation exam with the child’s physician. Have an emergency action plan or assure that the sporting team has a plan. Beat the heat and acclimate athletes to increased or decreased temperatures, and assure time to allow athletes time to either warm up or cool down. Use your head, and assure parents, athletes, and coaches are educated on concussion prevention, management and care. Obtain an up to date athletes medical history, with parent’s authorizations and contacts. Ensure that all athletic safety equipment is in working order. This includes having appropriate emergency medical equipment and checking fields or courts for hazards. Assure that teams and sports organizations provide properly trained coaches, assuring there is properly trained personnel that have first aid, CPR, AED and understand national emergency care standards. Encourage your coaches to complete sports safety courses such as NATA sports safety programs. nata.org/Sports-safety-for-youth-coaches-course (NATA, 2017). 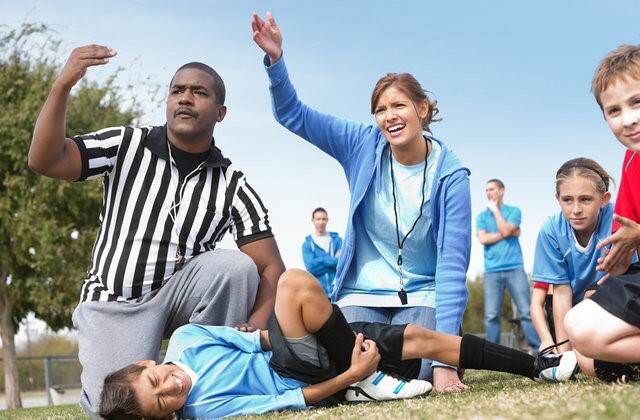 To help your sports teams with emergency action plans, first aid training, CPR training, AED training, and consultation and acquiring emergency medical equipment and supplies, contact SCS Safety Health and Security Associates LLC at (703)-779-7330 or dougs@scssafetyandhealth.com. ← Distracted Driving Remember: You Drive, You Text, You Pay.